Tata Tigor vs Rivals: A LOOK BACK WITH THE STYLE BACK! A decade back, the only body style that one could buy in a compact car would be a Hatchback, thanks to the 4m rule that our Government had. 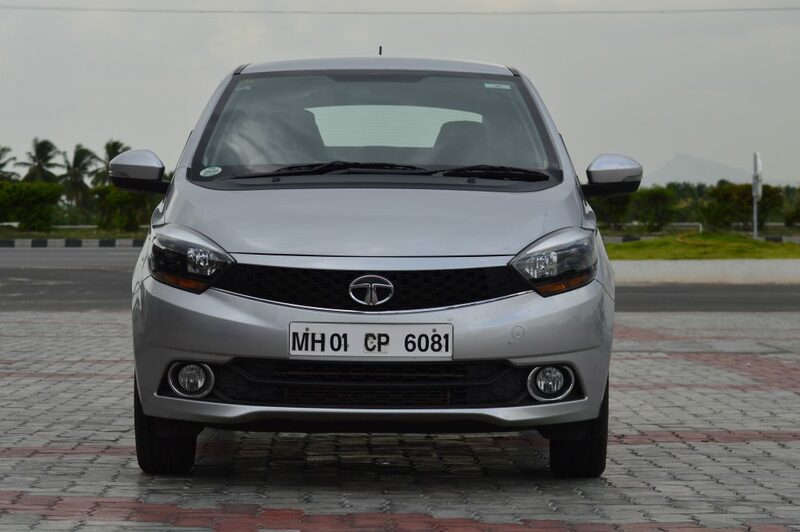 Tata was the first to read between the lines and thought of bringing in a new body style into the sub 4m segment – a sedan, the Indigo CS that was launched in 2008. Now, a decade has passed and the Compact Sedans are slowly and steadily replacing the compact hatchbacks from being first cars for many Indian families. We Indians are so obsessed with Sedans, Don’t we? A compact sedan is still considered premium than premium hatchbacks by most of the Indian families. There are quite a number of offerings in the compact sedan segment now staring from the segment leader by a huge margin Maruti Suzuki Swift Dzire to Hyundai Xcent, Honda Amaze, Tata Zest, Tata Tigor, Ford Aspire & Volkswagen Ameo. Though compact SUVs are becoming more popular than ever before, these Compact Sedans are here to stay. These are two segments where almost every automaker wants a presence. Tata with an aim not just to find a presence but also to create a strong hold in the CS segment has launched the Tigor a couple of months back and going by the sales figures the car is doing decently well. 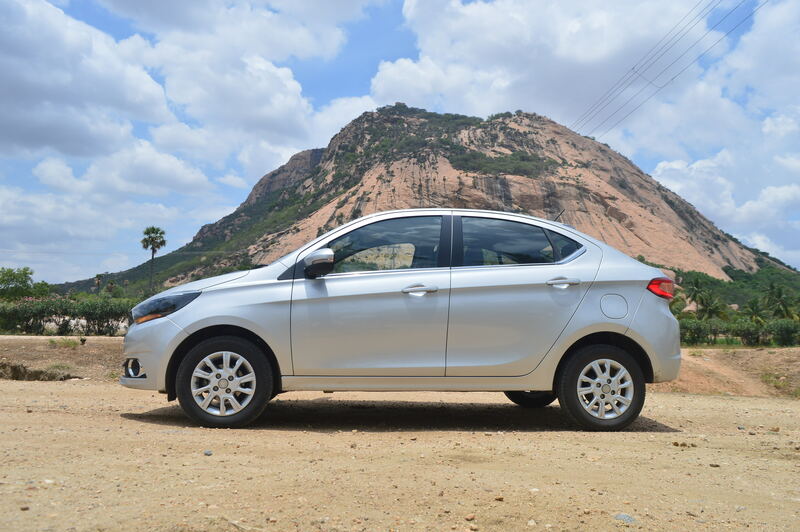 There have been a lot of discussions about the car on various forums already but we decided we will do a refresher comparo between the cars in the segment as few models have got a refresh / new variants like the Dzire, Xcent, Aspire. Considering various factors and being in the market for few months, let’s see of the Tigor still has the charm it had during the launch. Well when the Indigo CS was first launched, it was positioned as a car for a young professional! It definitely looked better than the Indigo / Indigo XL. Then Maruti took notice and launched the compact version of the then Swift Dzire which didn’t pass any beauty tests. The Indigo also got no radical updates and the CS segment was considered just another variant line of hatchbacks with boot. That’s when Honda came in with the Amaze, which looked very proportionate. This was possible because Honda made a sedan out of the compact Brio and not the Jazz! Amaze was the best looking CS, and then came Tata with the Zest taking the crown from the Amaze. And then Ford launched the Aspire which has raised the bars further. Next VW entered with the Ameo which couldn’t reach the bar. Aspire remained to be the best looking CS in the market until the strike back by Tata, who are never known for chick and contemporary looking cars, regained the crown and raised the bar further! The third generaion Dzire was launched recently with an all new styling and the Xcent has also received a facelift. Still, the Dzire & Xcent make us think of them as hatchback with boot and they cannot match the looks of the Tigor / Amaze / Aspire. Trust me, the Tigor still makes me wonder how could someone think of such a design in a compact sedan! The car in certain colours & certain angles looks pure awesome. I swear I spent almost 30 minutes just staring at the rear. We have to accept the fact that there are some uneven panel gaps but Tata has come a long way and these small factors are insignificant for the money they ask. Among the rest of the pack, Ameo & Aspire are better built and feel solid. The Zest is heavy and has good built quality. While the Amaze and Dzire feel light, Xcent feels better than the two. Even the interior of the Tigor, with good quality materials and design with piano black & chrome touches, is very attractive. Hyundai has some of the best materials in use in the interiors, the VW is well put together & good materials, Amaze & Aspire do their purpose well and the new Dzire is clever. Maruti has used a balanced mix of high quality materials at some touch points and some common shared parts to bring down the cost. LIKE: New benchmark in design with some nice touches like smoked headlamps, projectors, split LED Tail light with nice details, thick character lines, sloping roofline, etc,. DISLIKE: Some uneven panel gaps. 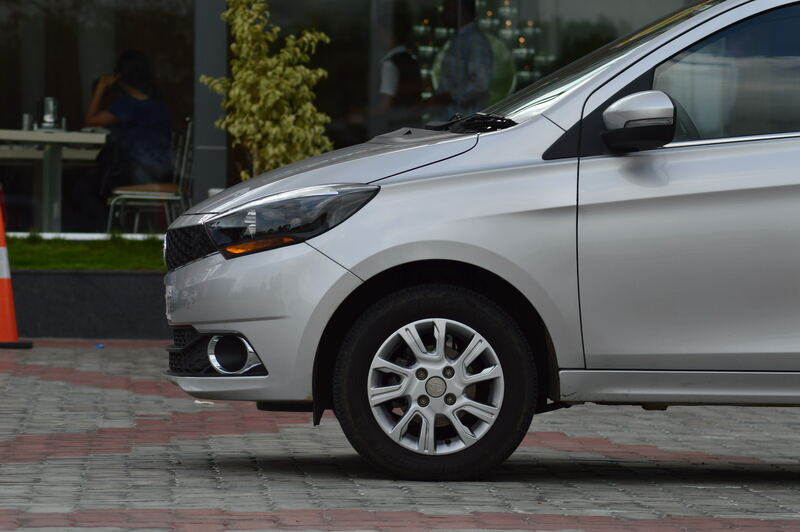 I also personally think Tata should give the Tigor 15 inch wheels as standard and reduce the ground clearance by 5mm. The Amaze is the smallest car with 3990mm length, the tigor measures 3992mm and rest of the pack are identical at 3995mm in length. The all new Dzire has become the widest car with 1735mm followed by the Aspire & the Zest at 1695mm. Next up is the Ameo measuring 1682mm followed by Amaze at 1680, Tigor at 1677 and the Xcent is the narrowest at 1660mm. 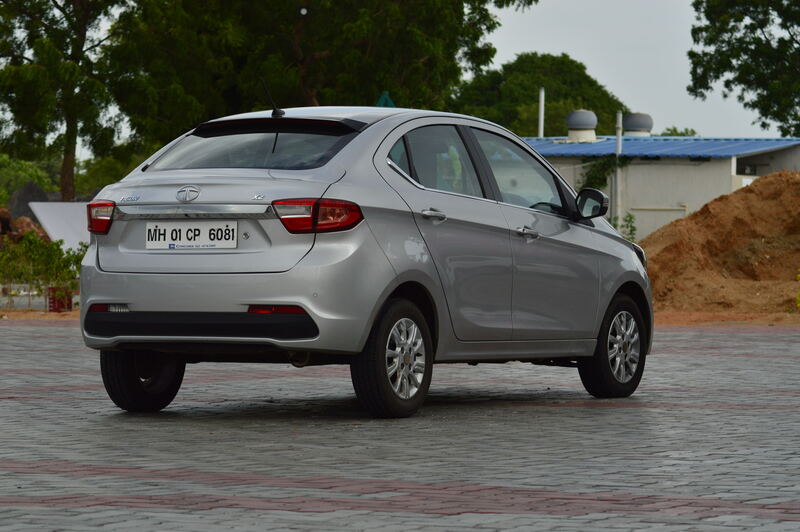 The Aspire has the longest wheel base of 2491 mm followed by the Zest & Ameo at 2470mm. The Tigor & Dzire have identical wheelbase of 2450mm followed by the Xcent at 2425mm and the Amaze has the shortest wheelbase of 2405mm. Numbers can be deceiving. Going by the numbers, Amaze seems to be smallest of all cars here but in reality it is the roomiest of the lot. Space available inside the car totally depends on how well the available area is used. Zest & Aspire owing to its dimensions have good space on offer and can seat three at the back. The new Dzire also has become roomier than the previous generation thanks to the increased dimensions. The Xcent & Tigor offer good comfort for two and third can be seated in decent comfort. The Ameo is strictly for two. The Tigor has the maximum boot capacity of 419 lts and the Ameo has the least at 330lts. Overall all of them have managed to extract more space from the boot and offer decent storage space for their size. Tigor’s hydraulic struts has helped them extract more space in the boot. LIKE: Though the car is based on a hatchback that is one segment below the rivals hatchback siblings, Tigor manages to be above average in most aspects and manages to have the largest boot space too. DISLIKE: Little more effort could have yielded more space inside the car. The loading lip is is too high for comfort added to the short opening. Wondering what if Tata had given the option of opening the rear windshield along with the boot…! 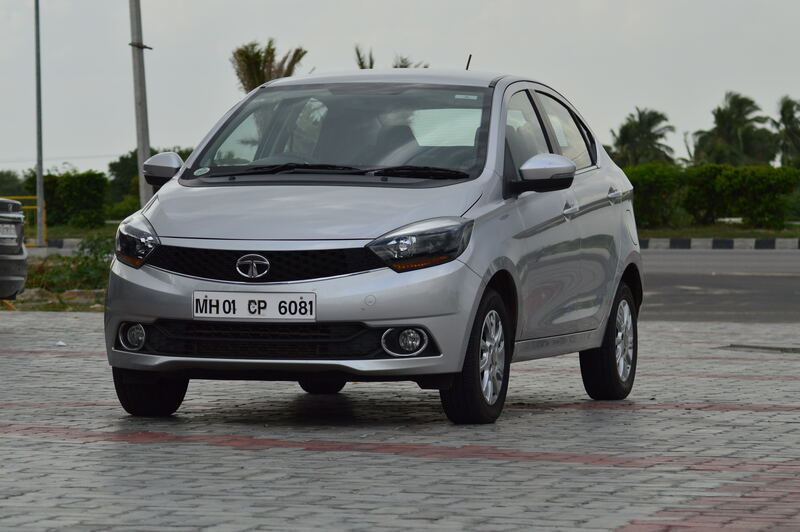 Tata 2.0 has been throwing a good lineup of features on all its cars and Tigor is no exception. The top model offers automatic climate control, touch screen infotainment system developed by Harman with Tata’s connectnext tech, steering mounted audio controls, voice command system, navigation, rear view camera, cooled glove box, etc,. The new Maruti Suzuki Dzire also comes with an extensively revised cabin that gets a new light beige and black dual tone treatment with features like flat bottom steering wheel, rear AC vents, climate control, and touchscreen infotainment system with Apple CarPlay and Android Auto among others. All cars here come with Touchscreen infotainment system with steering controls and various connectivity options for mobiles & climate control A/Cs. Xcent in addition offers rear A/C Vents & reverse camera, the Ameo also gets reverse parking camera & sensors. Tata cars are also known for their exceptional ride quality & Tigor is no different with a composed ride, no suspension noise, just gliding over potholes. Handling has nothing to tell about because with skinny tyres, high ground clearance & high centre of gravity, the Tigor is definitely not for enthusiasts but very satisfactory for a first time car buyer. The seats are will cushioned and comfortable. The air conditioner is also very efficient albeit it gets noisy at higher fan speeds. Like: Comfort & features on par with competition, Excellent ride quality even on very bad roads, Lots of well thought through storage spaces. Dislike: Seating position is tall even in lowest setting, presence of an arm rest could have made it more comfortable for the driver. The Tigor comes with two engine options: 1.2L Revotron Petrol / 1.05L Revotroq Diesel. On paper both the engines are decently powerful but on road due to the heaviness of the car, the performance is not great. You are never going to win any drag race but give them a light throttle and don’t push them hard, the engines have good driveability. There are also two driving modes on offer : City & Eco. Eco mode reduces the throttle response drastically and it gets irritating to get the car going. City mode suits the car well for normal driving and don’t even think of spirited driving. The cabin is very well insulated and NVH levels are decent but still there is along way to go to be like the Xcent. When we drive the diesel variant of the Tiago, we can understand that just 150cc & one cylinder more, the car can behave completely different. The Aspire & Ameo are best cars for enthusiasts especially the diesels. The engine, gearing, suspension, steering geometry are all just spot on. Amaze balances between sporty & soft, the Zest & Dzire have good ride – handling balance and the Xcent though much improved is still soft and good for city rides. For detailed understanding, see the specs below. Like: Excellent Ride Quality, engines though low on power are good for city runabouts. Diesel engine is good for highway cruising too. Dislike: Mediocre performance & refinement from both petrol & diesel engines. Tigor is equipped with ABS (Anti-Lock Braking System) with EBD (Electronic Brakeforce Distribution) and CSC (Cornering Stability Control), dual front aribags only downside being the safety features are not standard across the variants. All other cars get Dual Front Airbags & ABS. While Amaze & Ameo gets EBD, Aspire offers a total of six airbags on the top trim.! Like: No compromise on safety and the car is also heavy built. Dislike: To avail all safety features, one must go for the top variant. The Tigor’s pricing is its USP. With a starting price of 4.59L for the base petrol, it undercuts the nearest competitor by Rs.50,000, the segment leader by Rs.86,000 and the most expensive model by Rs.91,000. The top end diesel of the Tigor undercuts the nearest competitor by Rs.83,000, the segment leader by Rs.2,53,000 and the most expensive model by Rs.3,00,000. For the additional cost, the competition offers better engines but Tiago is still the king in the value for money game. 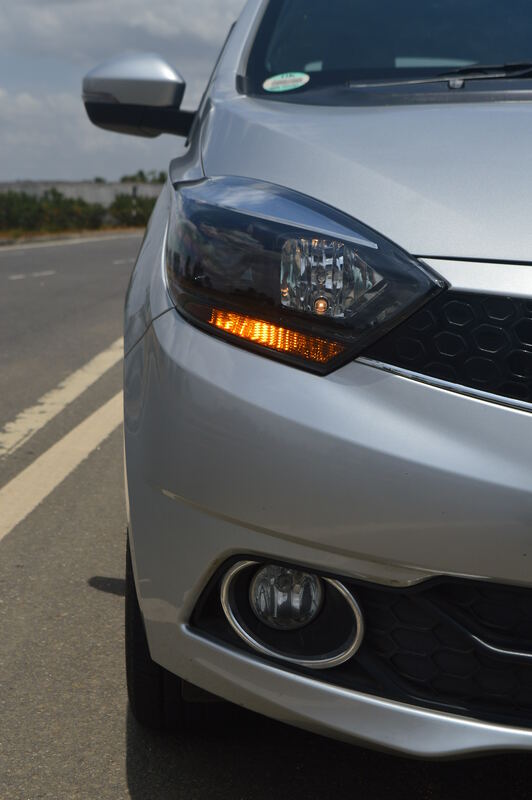 This article is a review of the Tigor against the competition and so, not every aspect of all the cars has been discussed here and the below opinion is given based on the power figures, price, features, and many other factors discussed above. The Amaze is a very good overall package which solves the purpose very well. The Xcent is a brilliant package by Hyundai with all right materials, right features, etc, except for the diesel engine that is underpowered, it is right up there. The Zest is a very practical product and first product from Tata 2.0 which is now conquering the cab market. The Aspire is an excellent attempt by Ford and they have thrown in all what is necessary to make a sporty sedan with all necessary comfort and safety features. Pricing is the only bottleneck for the Ameo or the car has very good potential to grow beyond what it is today in sales! The Dzire has been dominating the segment in sales and with the new avatar it has become better in almost all aspects and there are no second thoughts that it will remain undisputed in sales for some more years. And the Tigor. Our hero for today. Very nice & practical interiors, got excellent set of features, superb ride quality, very frugal engines, decent performance, lower cost of ownership, segment beating infotainment system, etc, are few of the positives of the Tigor. Agreed to the fact that it could have gotten a powerful engine, bigger wheels, better NVH, etc, but considering the asking price, the Tigor is definitely a great package for first time car buyers. Spot on pricing. Big bang for the buck. New engines with low power & no track record. Long term reliability is unpredictable.